Every summer, my family vacations together on the Oregon coast, quite near the location of a famous lighthouse, the Tillamook Head Lighthouse. It is positioned on a remote island just off the coast, a tiny outcropping of basalt rock barely large enough to support the seabirds that live there, let alone the massive structure of its chief inhabitant. The weather is extremely rough in this region with massive waves and winds that can get up to 100 mph, causing one to marvel that the structure was ever finished. Completed in 1881, it was the most expensive West Coast lighthouse that had ever been built, and not just in terms of money. When the initial surveyor, John R. Trewavas was coming ashore to begin his work, he slipped on the wet rock and his body was swept under the waves, never to be recovered. The construction was grueling, taking 575 days in appalling conditions before the lamp was finally lit. 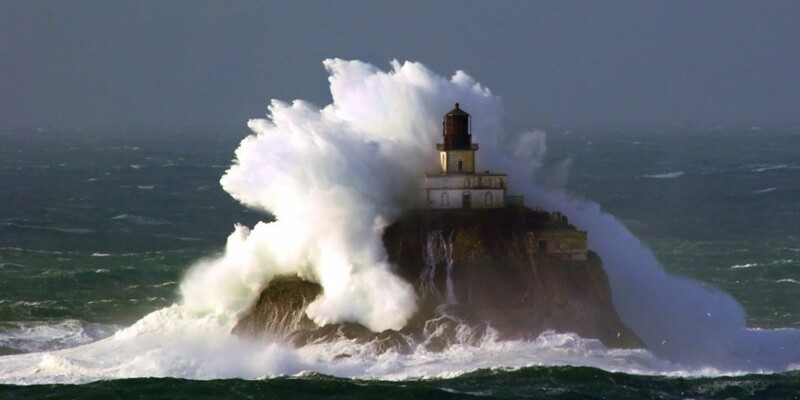 Over the years, wild storms continued to cause extreme damage, making the lighthouse incredibly expensive to maintain. It was finally decommissioned in 1957 after only 77 years of service, and now sits as a ghost on the coast. We hike along the coast trail every year, and have always wondered about it, and so last year, we decided to do a little research. We discovered that the lighthouse was purchased in 1980 by a group of private investors who gutted the building and turned it into a columbarium, which is a place where they store the ashes of people who have been cremated. Anyone should be able to appreciate the immense irony. The purpose of the lighthouse has completely changed from what it was intended. It was supposed to save people who were foundering at sea, not bury them there. It was supposed to be outward-focused; now, it is morbidly inward-focused. Sometimes, in my more cynical moments, I think that is what the church is like today. It is no longer outward-focused. It is no longer in the business of rescue. It is no longer a lighthouse, but instead, it has become a columbarium. It stores the ashes of dead Christians. They are dead, not because they no longer love Jesus, but because they have forgotten their purpose—the purpose of discipleship. At the beginning of His ministry, Jesus sat down with His disciples and gave them a handbook for discipleship. It is the longest sermon in the Bible, and we’ve called it the “sermon on the mount.” He uses two metaphors—salt and light—to clearly describe for His disciples what their purpose as disciples is supposed to be. We are very familiar with this first metaphor because the phrase “the salt of the earth” has become a common figure of speech. In Christian circles, we endeavor to understand our purpose here by thinking about the various uses of salt in Jesus’ time. We’re taught that salt purifies things, and so we assume that Jesus must have been referring to moral purity. We’re also taught that salt was a preservative, and so we conclude that our purpose here is to be a moral preservative in culture. For myself, I think that both of these ideas are problematic. In truth, salt was used for many things in Jesus’ time, but fundamentally, salt was always an additive. The basic purpose of salt is always outward-focused—it is found outside of itself. Now, the reason that I understand this so well is because I have a salt-eater in my family. Whenever we go out to dinner at a restaurant and sit down at the table, the very first thing that my five-year-old will do is take the saltshaker, begin to dump it out in her hand, and then start licking the salt. I have to insist, “Ivy, stop! That is not what salt is for.” Forget telling her that that is not the purpose of salt. Forget telling her that she is supposed to put it in something. She doesn’t recognize that salt is an additive, and so she has lost the true purpose of salt. If you see your purpose here as a moral preservative—if you think that you’re here to stem the moral decay of culture—then the attitude that you’ll communicate to all those around you is that you’re better than them. You will develop a legalistic and judgmental relationship with those around you; moreover, you will begin to subtly segregate yourself from the rest of the external world. You’ve forgotten that your purpose is that of an additive. The result is that the world will throw you out and will trample your testimony underfoot. Look, we are not here to preserve culture. That is not the gospel and never has been. We’re here for the purpose of proving the gospel—that God saves people who are undeserving because of His grace. The second metaphor is equally familiar—we are “the light of the world.” Jesus compares us to a city on a hill which cannot be hidden, and also to a lamp which is put on a lampstand in order to illumine the entire house. The light in the metaphor is the good works of the worshipers, but the point of comparison is supposed to be the position of the lamp. A lamp is placed in such a way as to be outward-focused. What Jesus is really talking about here is a lighthouse—a beacon that is designed to rescue others. The purpose of discipleship is always outward-focused. A city on a hill in our world cannot be hidden because of light pollution. We have lights everywhere that stay on at night, making it impossible to hide the presence of a city at night. However, in the days before universal lighting, the light from a city would come from all the diverse oil lamps that illuminated each individual home in the community. There was something collective that was happening in that city on a hill as a result of ordinary people going about their lives. It was a small village of people that shone together as a cooperative, and their light defined the path home for weary travelers lost on the road in the darkness. Unfortunately, a city on a hill can easily become inward-focused. We forget that our purpose is to rescue others, and instead, we think that our purpose is to build a tiny alternate subculture, a Christian fortress where we can exist with those people who think like us and believe like us. We come to believe that a city on a hill exists for the purpose of preserving ourselves and our special culture from the corrupting influences of the outside world. We cultivate our little tribe that includes a few but excludes everyone else based on our comfort and preferences. But a city on a hill was never meant to be a tribe. It was never meant to be exclusive, like a club. It was never meant to be “segregated” in any way. It was meant to be a lighthouse. Tribalism in our churches simply reveals that we have lost our sense of purpose. What is the real purpose of discipleship? Is it to love God and obey more and more? Certainly. Is it to be conformed to Jesus’ image to a greater and greater degree? Of course. But there is something that is far more specific. Ultimately, the purpose of discipleship is NOT to produce disciples, but to produce disciple-makers. That subtle difference results in a vast chasm between those who are inward-focused and outward-focused. It is the difference between becoming exclusive versus inclusive in the way that we go about our lives. In Matthew 28, in His last sermon to His disciples, Jesus gave them a new purpose: to make disciples. You see, as it turns out, there was a limited time for discipleship—just three years—and then they graduated. They were no longer His disciples; instead, they became disciple-makers. For that matter, a radical change of language happens between Acts 1 and 2. They are no longer called disciples in the text; instead, they are called apostles, the “sent ones.” You cannot be a “sent one” and remain inward-focused. You have to start thinking beyond Jerusalem to Judea and Samaria and the ends of the earth. You have to start thinking beyond the confines of your own self-interests or the interests of your tribe. Ultimately, you must grapple with your true purpose as a disciple. Are you a lighthouse or a columbarium? I sooooo want to be a lighthouse and like Christ. In my study of John and Luke currently I am exhorted to share and invite lost people to “come and see” and “accept Jesus as the Son of God, the Passover Lamb, the eventual king, the Divine, Holy God, and our eternal life giver, et al…. I so want to tell…but I have realized my life is too segregated and then I am self-employed at home, etc. My prayer is, Lord, where do I go with You, My Light, my very breath!